I was on mother duty with Andrew who in like to call “Durban curry” he baked some bread as I was still on shift. I did a bit of helming and grinding to keep warm, while I was sitting on deck skipper shouted “Whale” when I turned my head I saw it. The whale kept on coming back like it knew we were watching it but the skipper wasn’t happy about it cause it came 25 feet close to the boat and it could do some serious damage to the boat. I was home sick thinking about my family back in South Africa who I haven’t seen in 18 days cause I had to leave for Cape Town first to wait for the boat to arrive. Iv been missing my siblings, my granny and my son who is 4 months. Too sad I couldn’t call or email them and also I missed making music with my friends. Another cold day with my gloves wet, hands freezing and having a bit of regret why I’m I doing this sailing but I had a chat with one the crew members and he made me feel a lot better and positive about it, he told me everyone is going thru this so its normal I shouldn’t feel bad about it. I did my first logbook and I enjoyed. 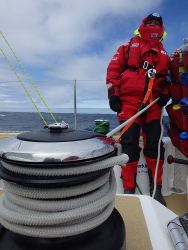 It was a quite day we didn’t have much wind so there was non much to do on deck, we had to do a sail change while we were busy I feel on my right hand it was sore that I couldn’t stretch it full length. I had a good start of the day as I was going off shift at 6am and I saw the sunrise which was a greatest feeling ever it was a beautiful view. I was believe that sunrise and sunset are the best moments of the day. It was the skipper birthday (Rich Gould) who was turning 27 and we a good tasting chocolate cake. It was back to big waves and cold weather, during the afternoon shift while sitting on deck I got hit by a big wave on my back and I went straight to the winch and I hurt my right arm but it wasn’t too bad cause I was clipped on so it didn’t make too much damage. Late night shift was hard cause it was dark and we had to do a lot of sail change but I managed with the help of my good team and we did a great job.